President Donald Trump has expressed willingness to engage with the Iranian leadership two days after pushing back against the threatening rhetoric of the Iranian president. “I withdrew the United States from the horrible one-sided Iran nuclear deal. And Iran is not the same country anymore, that I can say. And we’ll see what happens. 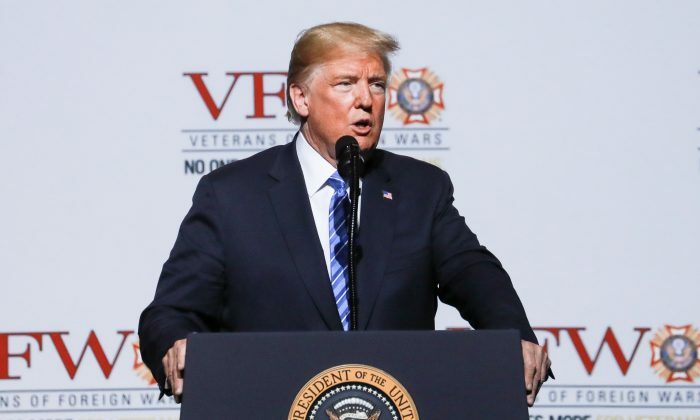 But we’re ready to make a real deal, not the deal that was done by the previous administration, which was a disaster,” Trump said on July 24 at the Veterans of Foreign Wars national convention in Kansas City. Rouhani hasn’t responded, though his Foreign Secretary Javad Zarif called Trump’s comment “bluster” on Twitter and Zarif’s spokesman called it “psychological warfare,” reported the Iranian state-sponsored ISNA news agency. The Trump administration has increased its pressure on Iran’s Islamic regime in recent months. In May, Trump pulled out of the Iran deal, which was signed by former President Barack Obama, the other four permanent members of the United Nations Security Council—Russia, China, the United Kingdom, France—Germany, and the European Union. Under the deal, officially known as the Joint Comprehensive Plan of Action (JCPOA), Iran received up to $150 billion in sanctions relief as well as cash payments. The two main concerns that the Trump administration had with the JCPOA was that it included so-called sunset clauses, which would have allowed Iran to install thousands of advanced uranium centrifuges by 2026. Another concern was the fact that Iran’s ballistic missile development was not covered under the agreement. The withdrawal from the agreement came after Iran was given months of opportunity to re-negotiate these parts of the deal. Trump has since ordered the imposition of “the highest level” of sanctions, part of which will go into effect on Aug. 6 and the rest, including the key ones on oil, energy, and banking, on Nov. 4. U.S. State Secretary Mike Pompeo dissected the Iranian regime’s litany of abuses in a July 22 speech, calling out several leading Iranian officials by name for corruption, including Supreme Leader Ayatollah Ali Khamenei. Iran has been trying to salvage the nuclear deal with the remaining signatories and convince them to maintain business ties, but violating the sanctions would put entities at risk of losing access to the U.S. banking system. More than 50 international companies have left Iran already, said Brian Hook, director of policy planning for the U.S. State Department, in a July 2 briefing. Pompeo previously said the United States is willing to lift the sanctions again, but listed 12 demands that the Iranian regime will have to meet first, including the end of its ballistic missile program, releasing detained Americans, and stopping its support of terrorist groups and militias including Hezbollah, Hamas, and the Houthis, as well as withdrawing its forces from Syria. At the same time, the Trump administration maintains its not pursuing a regime change in Iran, or at least not necessarily. “The only change we want is a change of behavior,” said State Department spokeswoman Heather Nauert during Tuesday press briefing. Human Rights Watch released its 2018 ‘World Report’ on Monday, slamming Iran for widespread abuses. “Authorities in the security apparatus and Iran’s judiciary continued to target journalists, online media activists, and human rights defenders in an ongoing crackdown that showed blatant disregard for international and domestic legal standards,” the report stated, listing further transgressions against religious and other minorities. Pompeo had an op-ed published in the USA Today on Tuesday, calling for the end of religious persecution in several countries, listing Iran first. Among their grievances are the lack of drinking water and the falling price of Iran’s currency, the rial, from less than 10,000 to the dollar a decade ago to over 43,000 to the dollar. Meanwhile, many Iranians are left to buy dollars on the unofficial market for over 80,000 rials. Some women in Iran have also been defying the regime by appearing in public without their hair covered by a hijab, which poses the risk of punishment ranging from a fine to prison time. The Iranian regime began with a blend of Soviet subversion, and the influences of Sayyid Qutb—a founding father of the Muslim Brotherhood—who combined socialism with Islam to create the totalitarian theocracies that have since swept the Muslim world. Dr. Zuhdi Jasser, president of the American Islamic Forum for Democracy told The Epoch Times in a Dec. 14, 2017 interview that Qutb’s socialist Islam created the idea of “Islamism” which warped the concept of sharia (Islamic law), and advocated for “offensive jihad,” which jump-started many terrorist movements.